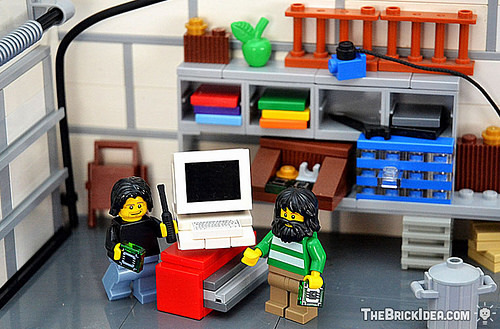 Ohio-based builder JD Keller has built this great minifigure scale vignette that depicts Steve Jobs in Steve ‘Woz’ Wozniak’s garage back in the mid 1970s. Amazingly, the billion dollar company Apple Computing started out as Woz’s garage-based hobby so we are witnessing the ‘Birth of Apple’. I love the panelled garage walls and the various electronic bits and pieces on the shelves. Don’t miss the classic large red toolbox with sliding drawers, the Apple colours on the shelves, and the original wooden Apple I computer in the background.